Official poster of the 24th Cannes Film Festival, an original illustration by French artist René Ferracci. 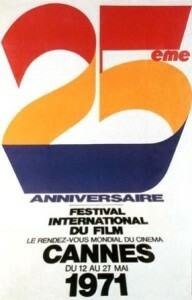 The 24th Cannes Film Festival was held from 12 to 27 May 1971. The Palme d'Or went to The Go-Between by Joseph Losey. The festival opened with Gimme Shelter, a documentary about English rock band The Rolling Stones directed by David Maysles, Albert Maysles and Charlotte Zwerin and closed with Les mariés de l'an II, directed by Jean-Paul Rappeneau. The festival paid tribute to Charlie Chaplin and honored him with the title of Commander of the national order of the Legion of Honor. ^ "Posters 1971". festival-cannes.fr. Archived from the original on 18 October 2014. ^ a b "Awards 1971 : All Awards". festival-cannes.fr. Archived from the original on 29 October 2013. ^ a b c d "Official Selection 1971: All the Selection". festival-cannes.fr. Archived from the original on 26 December 2013. ^ a b c d "24ème Festival International du Film – Cannes". cinema-francais.fr (in French). Retrieved 6 June 2017. ^ a b "1971 - Le Jury, Les Prix". cannes-fest.com (in French). Retrieved 25 May 2017. ^ "From anecdote to legend". cannes.com. Retrieved 25 May 2017. ^ "Charlie Chaplin Stole the Show at the 1971 Cannes Film Festival". nla.gov.au. Retrieved 25 May 2017. ^ "1971: Tribute to Charlie Chaplin". festival-cannes.fr. Archived from the original on 24 December 2013. ^ "25th Cannes Film Festival". ina.fr. Retrieved 25 May 2017. ^ "Juries 1971: Long film". festival-cannes.fr. Archived from the original on 4 March 2016. ^ "10e Selecion de la Semaine de la Critique - 1971". archives.semainedelacritique.com. Retrieved 1 July 2017. ^ "Quinzaine 1971". quinzaine-realisateurs.com. Retrieved 1 July 2017. ^ "FIPRESCI Awards 1971". fipresci.org. Retrieved 2 July 2017. ^ a b c "Cannes Film Festival Awards for 1971". imdb.com. Retrieved 2 July 2017. This page was last edited on 1 July 2018, at 23:03 (UTC).